Best things to do in Ipswich - a destination on the rise! Best things to do in Ipswich – a destination on the rise! Ipswich. It’s not a name that normally conjures up images of a family holiday destination. We passed through the area about eight years ago when we were looking into investment properties. We didn’t look past a couple of streets as we thought it just wasn’t us. 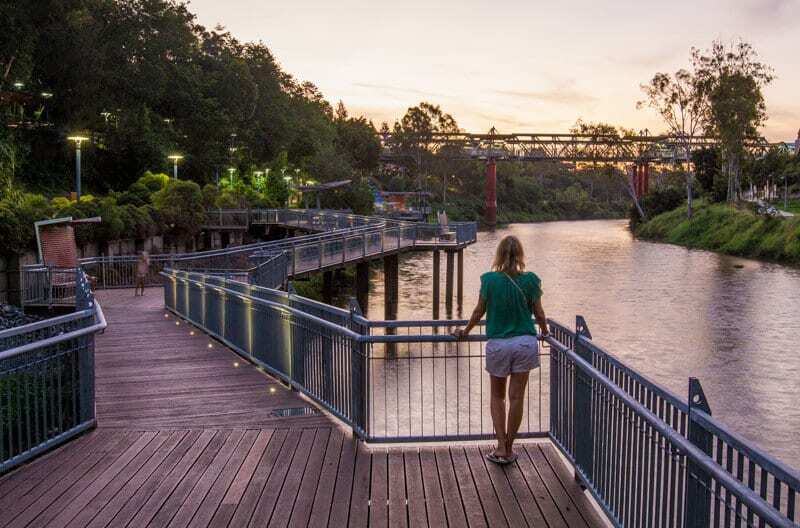 We’d heard there was a bit of revitalisation going alongside a huge growth spurt and when we were invited by Ipswich Council to see what’s happening we decided to stay yes and see what was going on in this rising outer suburb of Brisbane. 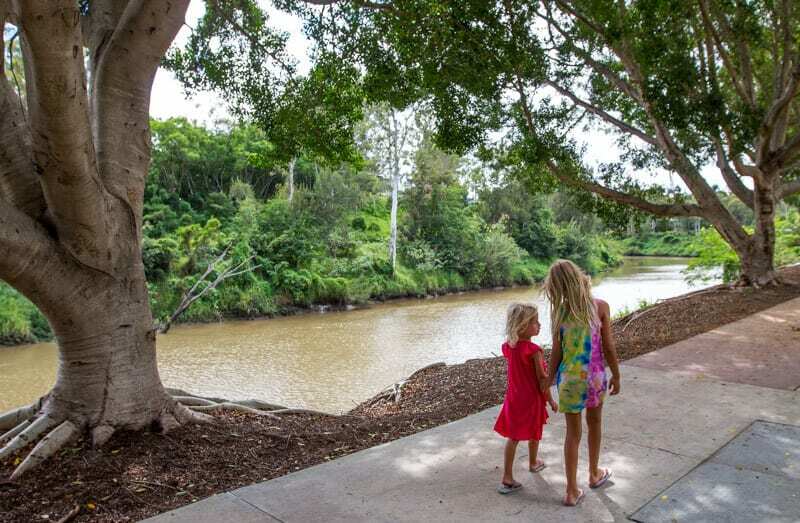 Ipswich is only 35 minutes west of Brisbane making it an easy commute by train or road, and due to its cheaper housing, it’s drawing out new blood, including young couples and families! New blood and money brings new facilities and services and a vibrant energy. 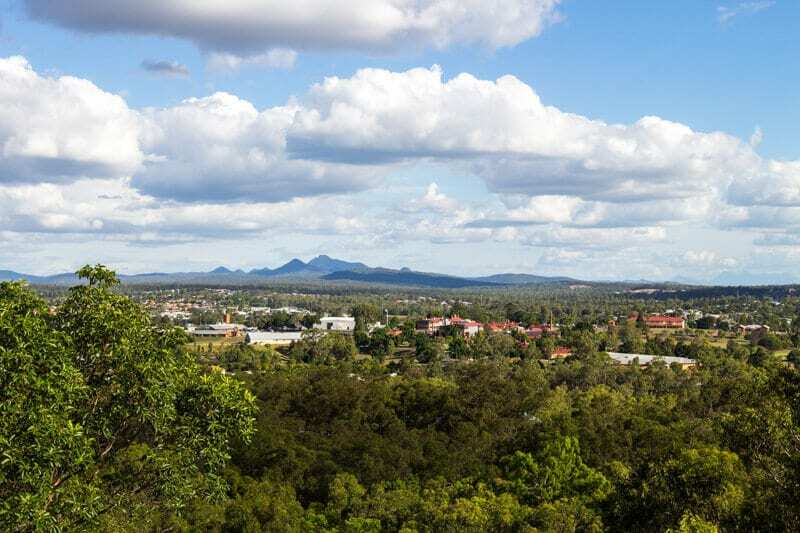 We were impressed by Ipswich and are excited to share it as a fantastic place to visit for those in the nearby areas of Brisbane, Gold Coast, Toowoomba and the Sunshine Coast, whether for just a day trip or a longer stay. Yes, it’s easily accessible to all those regions. We chatted to many of the cafe owners and people newly moved to the area, all of who agreed that Ipswich is growing up. We’re putting Ipswich on the one to watch list for destination and trend growth AND are spewing we did not buy investment property there when we had the chance. Ipswich reminded me so much of Newcastle in NSW – an area with an industrial history and not so pleasant tasting reputation that within my early twenties started to find its own groove and identity and flourished into this trendy and hip place to be. You can check out our video sharing our first day adventures in Ipswich. Subscribe so you don’t miss more travel videos. Click on each link below to go directly to each topic or scroll down manually. 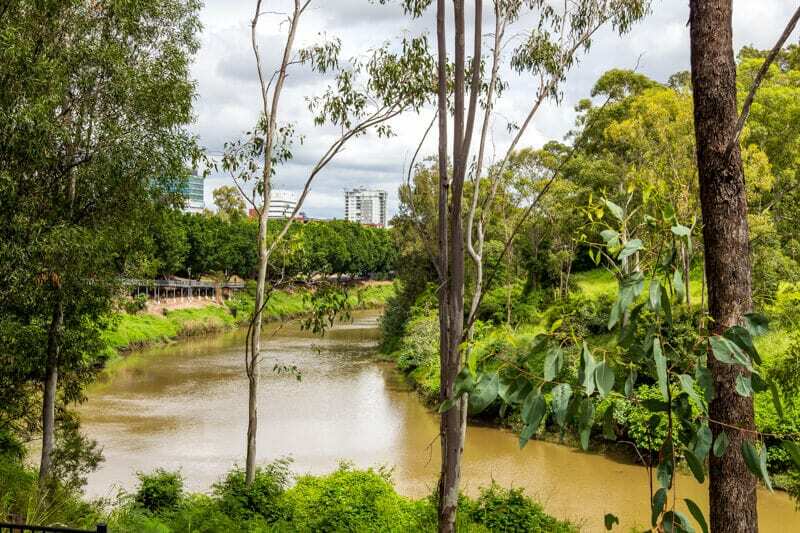 The Bremer River is a quiet meandering river with high banks covered in thick vegetation that runs through the centre of Ipswich. I felt like I was in Laos rather than Australia. 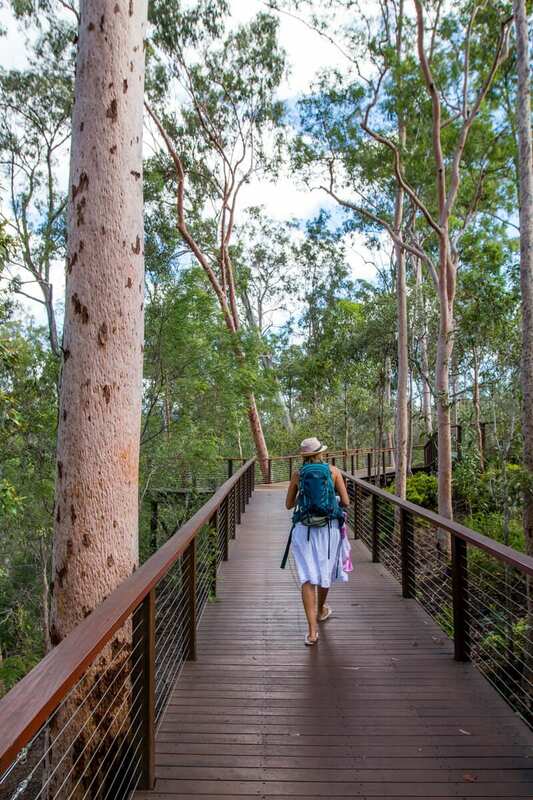 Of a morning and afternoon, we enjoyed a stroll along the lovely 1.2km boardwalk from the Bradfield Pedestrian Bridge to the Bob Gamble Park. There are plaques with historical information along the way to learn more about Ipswich, like how it was going to be the State capital, but because the river wasn’t wide enough for shipping purposes, Brisbane won the title. The river might not be wide, but it sure can run deep. It sometimes floods in Ipswich; in the disastrous 2011 floods the water went up into the Coles supermarket in town. It’s so hard to imagine when you stand beside the river because you are about 20 metres below the bridge. The floodwaters kissed the bottom of it – that’s an insane amount of water rising! Sunset and twilight is a pretty time to go for a walk and if you like photography you can get some pretty shots of the old bridge. After eight years I’m kinda over kids playgrounds, but as much as I try to avoid them, there’s no escaping them on a family holiday. 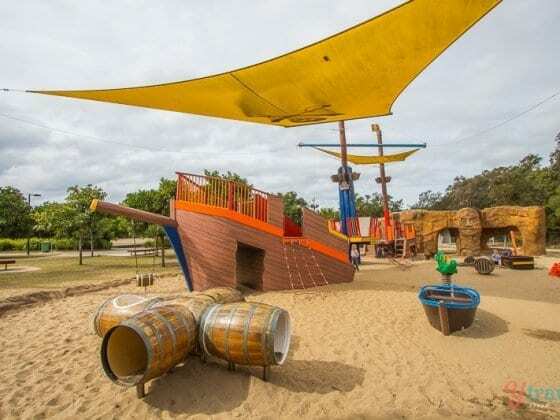 The playgrounds in Ipswich make the experience a lot more bearable. But do not take my word for it, it’s all about what the children think. 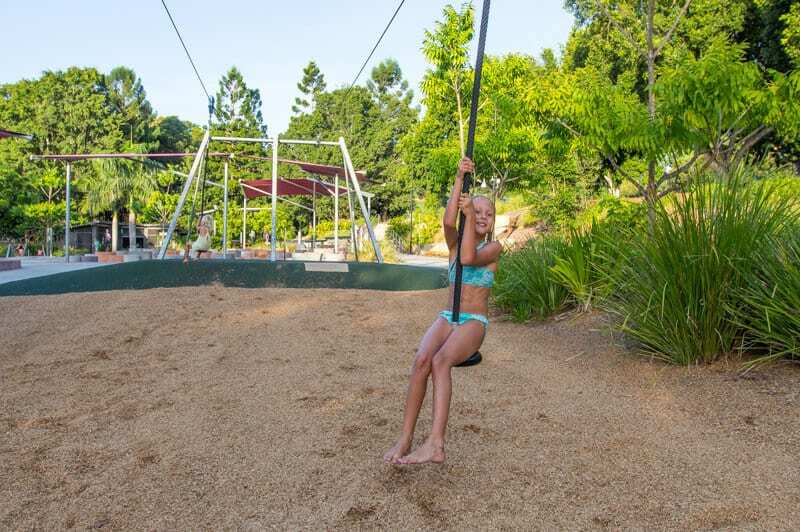 There’s a lot of money gone into this area to create a great lifestyle for families, so with that comes epic playgrounds that are free, sparkly and have cool chill out areas for playground-worn mums and dads. They were some of the best we’ve seen and even I was impressed. 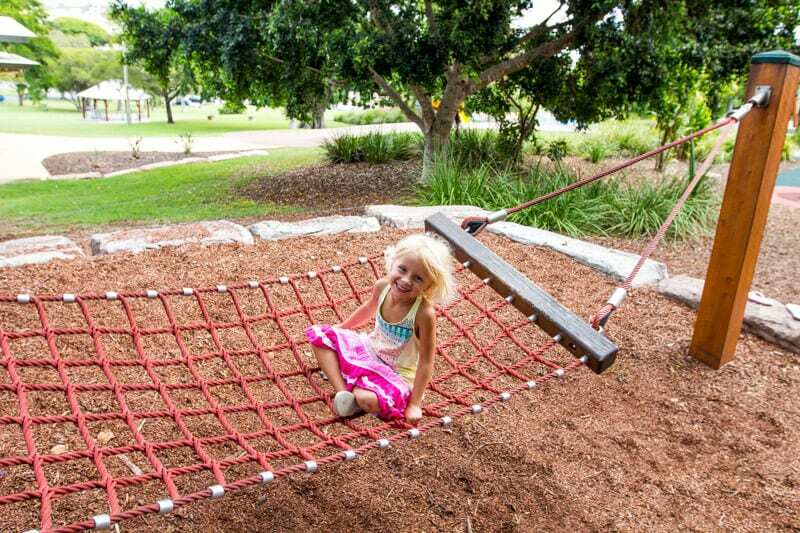 There are different sections to the Queens Park playground to suit different age levels. 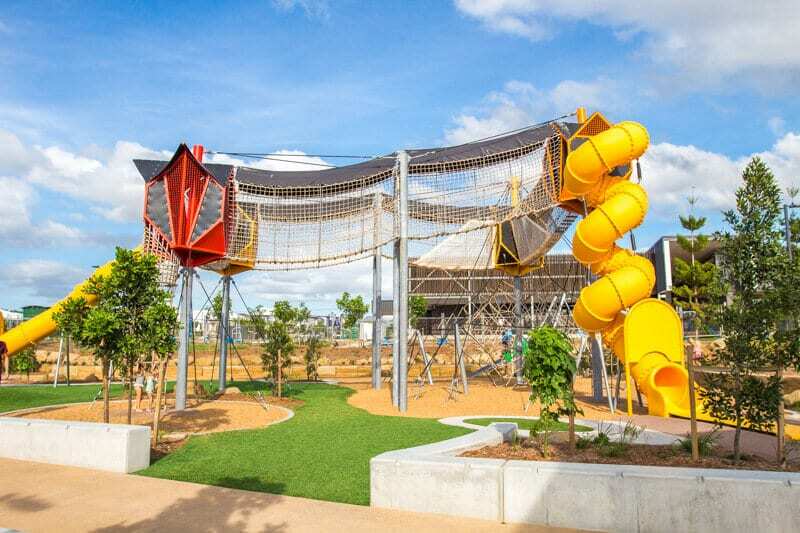 It’s design was inspired by the city’s coal mining history as its inspiration, and features a water pump play area, liberty swing and climbing wall. 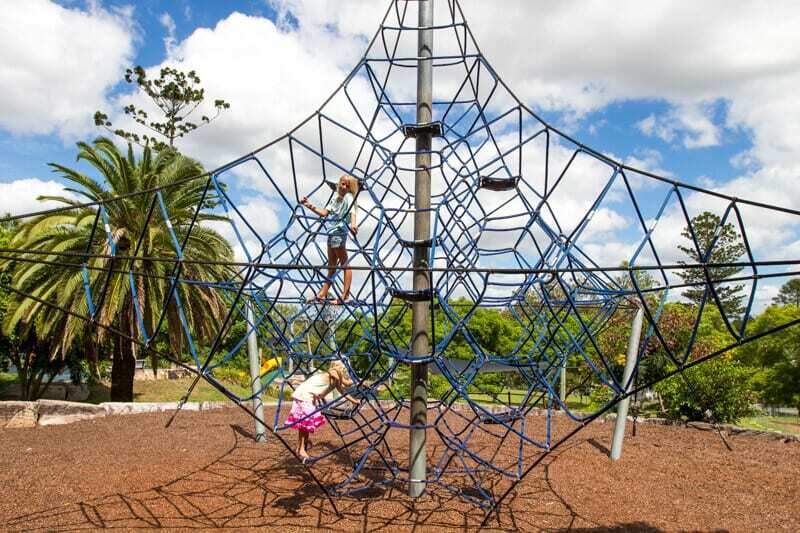 Our girls spent ages going back and forth on the flying fox and climbing the spider web. The playground is wheel-chair friendly as well. 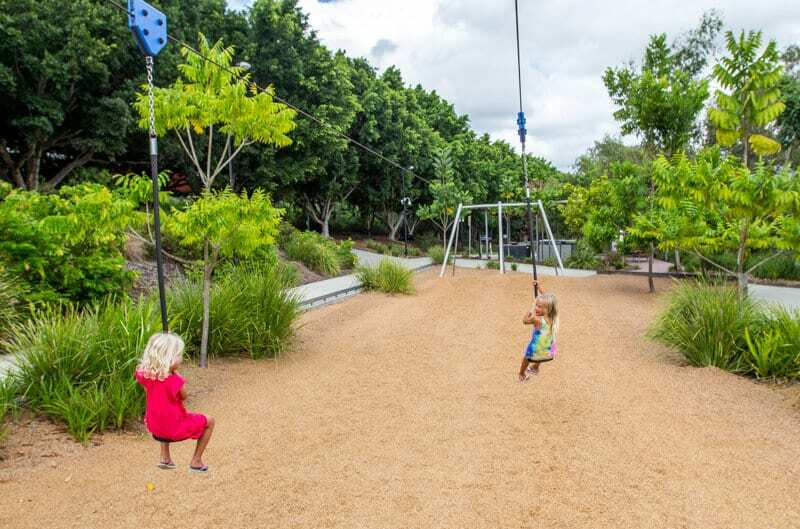 At the end of the River Heartlands Boardwalk is the Bob Gamble Park which has a playground for kids, BBQs, river views and plenty of shaded areas. 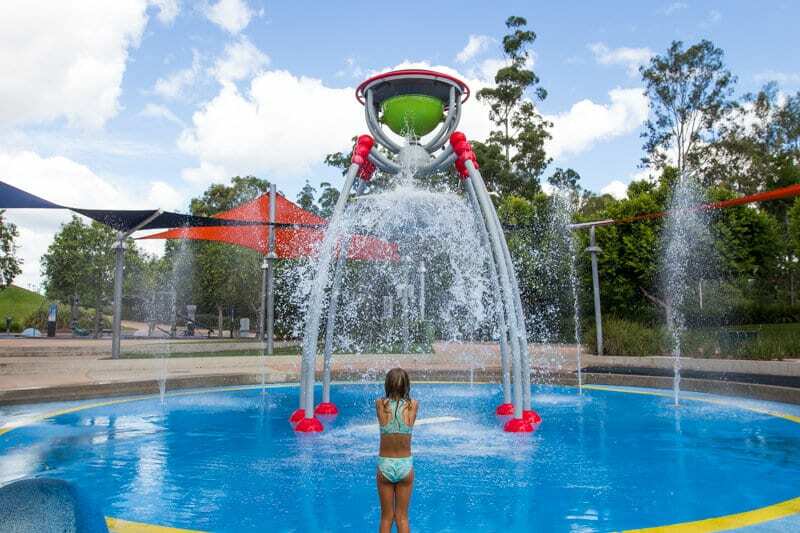 The kids will love the zero-depth water park, the climbing spider and the 25-metre flying fox. Our favourite were the forts, totems, and tribal vibe in the Discovery Forest. It’ also a cooler place to play when that sun beats down. The helpful ladies in the Ipswich visitor centre told us of this playground in the middle of the new Providence residential area in Ripley Valley only about 10 minutes out of town on the way to Springfield. This $3.2 million water park is free for the community and is one of the best residential parks I’ve ever seen. 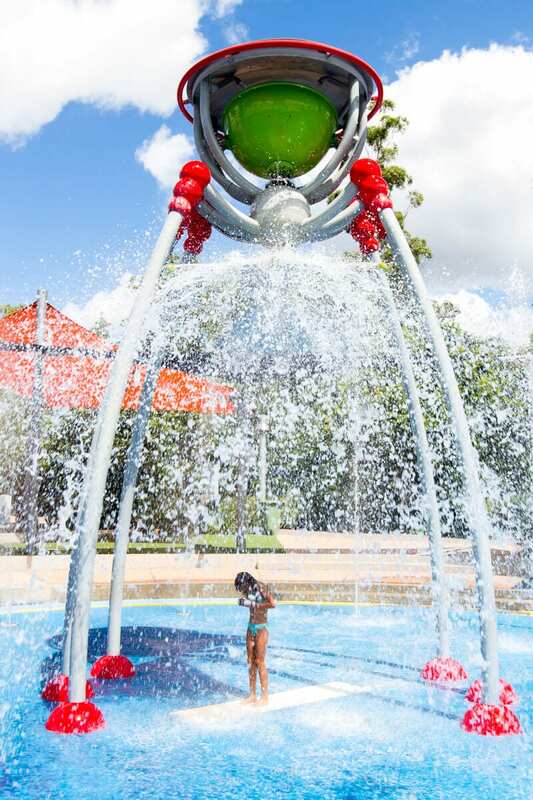 There’s a water play park that spurt towers of water high into the sky, and a maze of aqua arches for the kids to run through, as well as a designated toddler water playground, an older children’s zone and space for adults. The majority of the area is covered in shade and there are plenty of shady trees to sit under. The girls loved climbing up the enclosed rope ladder to up to the elevated skywalk (an enclosed rope bridge) and then sliding back down a huge and fast slide. The flying fox was also a favourite. 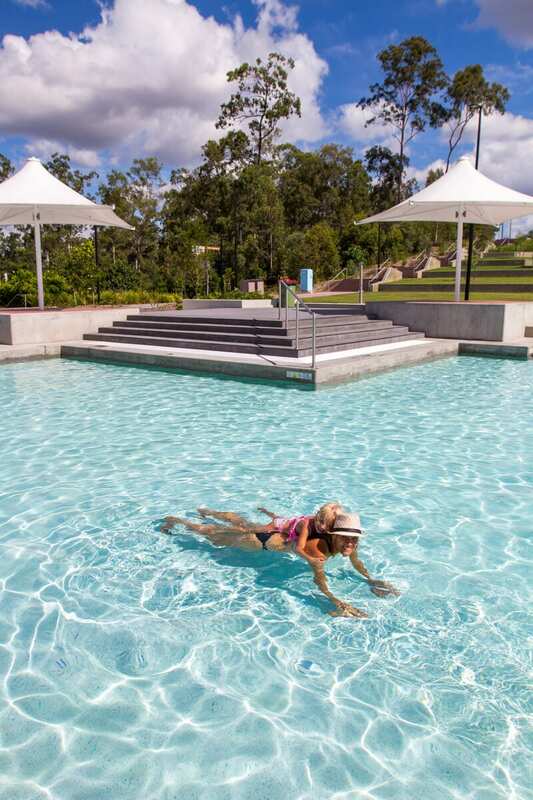 Just a 30-minute drive from Ipswich city centre in the rapidly growing Springfield area is the large Orion Lagoon, situated next door to the Robelle Domain. It’s a series of pools and water features catering to kids of all ages (that includes parents) and protected by lifeguards. Just look at that water! There are plenty of shaded and grassed areas, so bring your picnics and intend to stay for awhile. In Ipswich fashion of providing quality services and facilities, it’s all FREE! 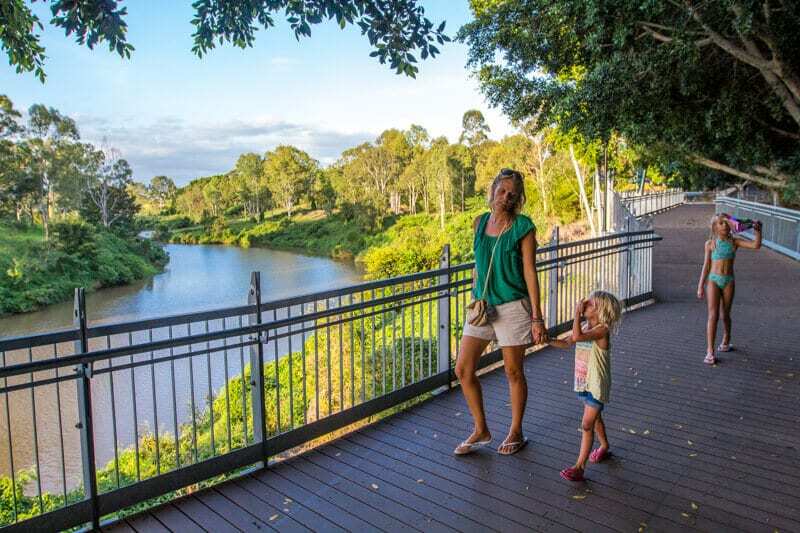 Just over the footbridge from Orion Lagoon is Robelle Domain, the largest park precinct built in Queensland since Brisbane’s Roma Street Parklands. There’s a zero depth water play area with a huge tipping bucket – it was the first time Savannah has braved standing under one and she loved it!! 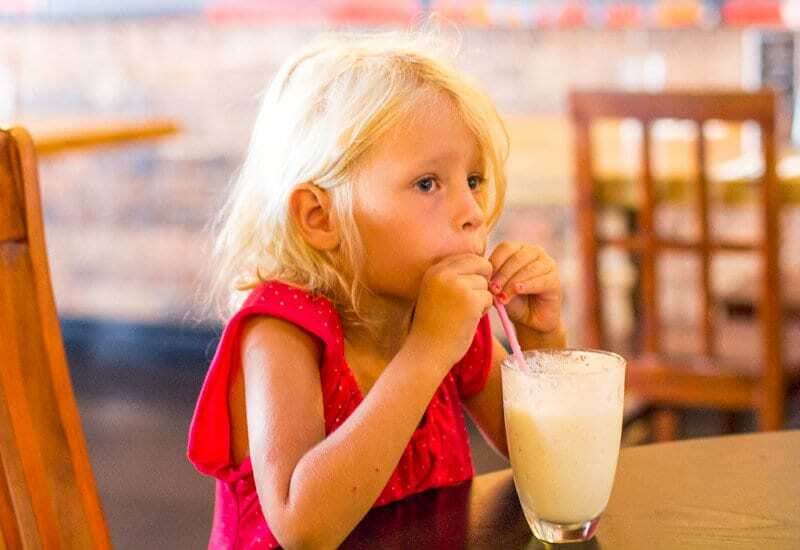 And there’s an onsite cafe for mummy and daddy to chill whilst the kids play. Robelle Domain also has an 11-kilometre pathway network of walks. 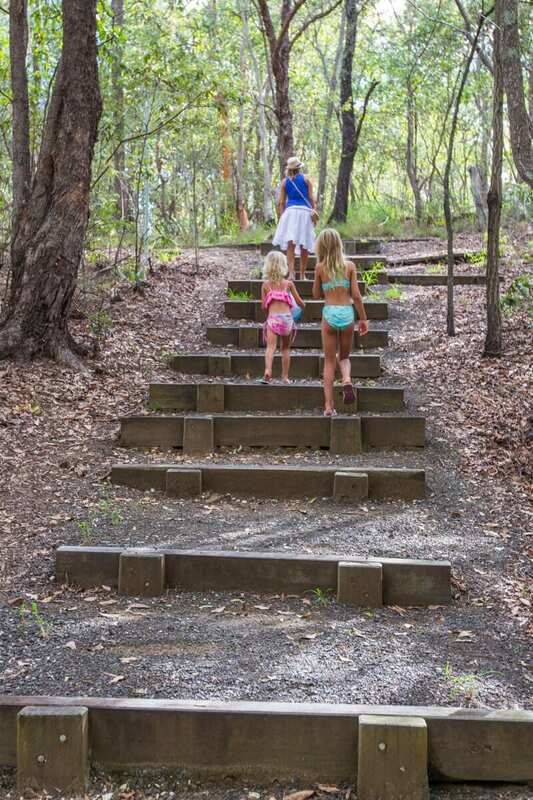 We enjoyed the short walk up to the top of the forest – easy for the kids to do and plenty of serenity. At night, there is a light and sound show from the 9-metre high light tower installations which we did not get to see. Robelle Domain is also the place for markets and public events such as jazz afternoons. I tell ya, watch the Ipswich space – there is a lot of cool things happening here. There’s a lot to write about Queens Park. 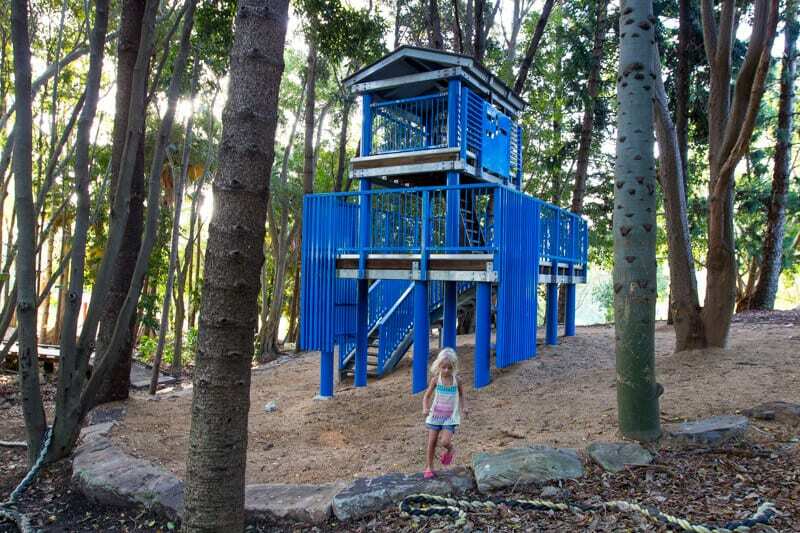 It’s one of the oldest parks in Queensland and has lush green parklands with plenty oof large shady trees and facilities including a cafe, playground, nature centre, and gardens. You can easily spend at least half a day here. 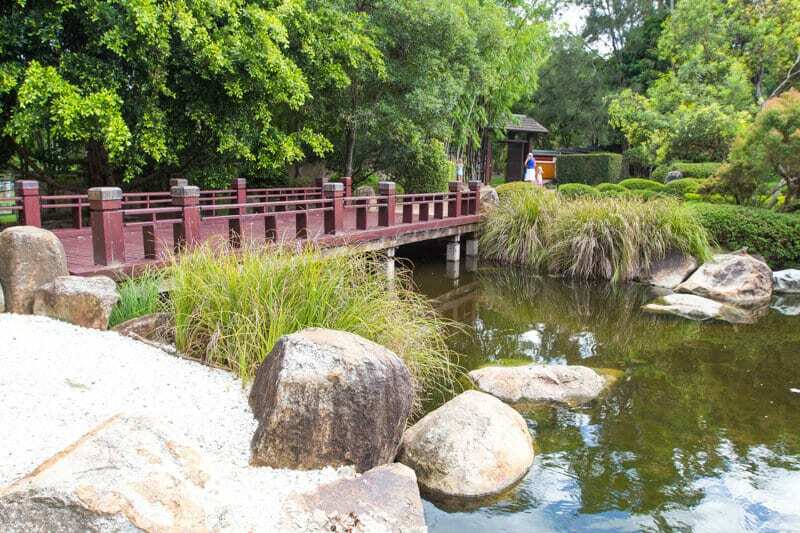 Nerima Gardens, the Japanese gardens tucked inside Queens Park is a lovely place for a walk and some time out among the Australian native plants, fir trees, a bamboo forest, and pretty flower and boardwalks over a lake. We saw about 15 lizards sunning themselves on the green grass beside the lake. I’ve never seen that many in one place before. 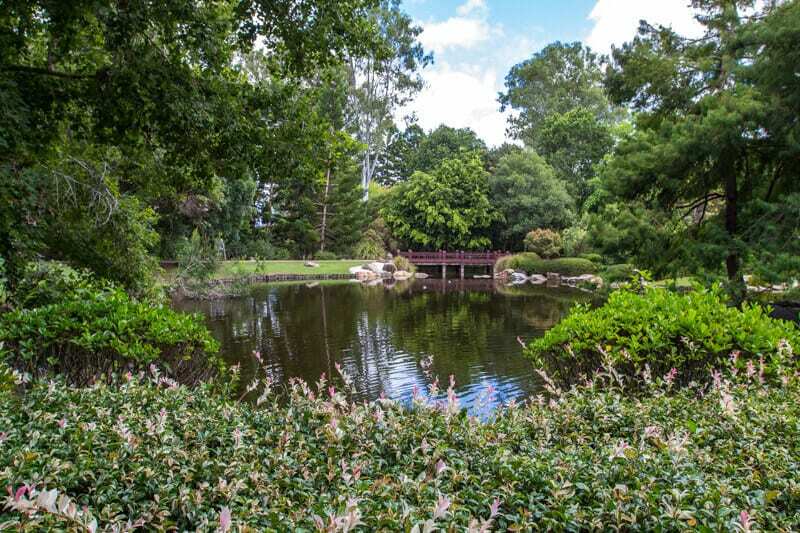 It’s a serene little haven. For over 80 years locals have enjoyed visiting the Ipswich Nature Centre. 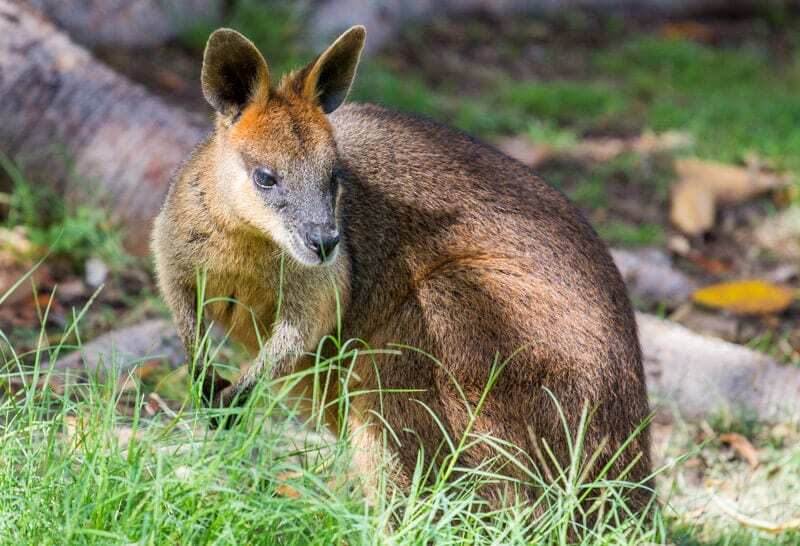 For a suggested gold coin donation you can stroll along the shady walkways to see native animals such as wombats, wallabies and a nocturnal bilby exhibit. We saw one right up close, which was a first for us. They are very cute! Ipswich is slightly rural which means you’re going to have a lot of open spaces and beautiful scenery. There are plenty of hiking trails through rocky outcrops, forested ridges and valleys to explore. When we first checked into our apartment I asked the receptionist what her favourite thing was to do in Ipswich and she said The Redbank Plains had a lot of hiking trails she loved exploring and it was only 15 minutes from her house! It’s also popular for horse riding and mountain biking. It was a great local tip we, unfortunately, did not get time to pursue. 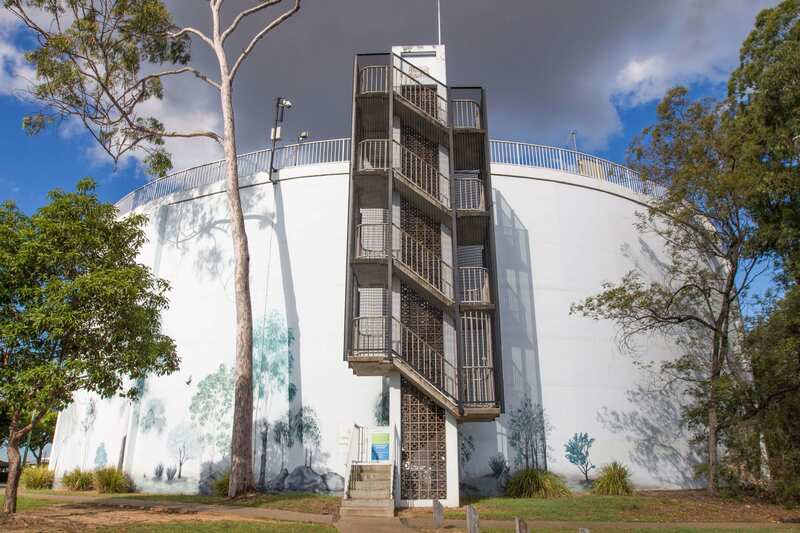 For an easy family walk and for superb 360-degree views of Ipswich and surrounding Scenic Rim in the heart of the city, go to the Denmark Hill Conservation Reserve and climb to the top of the water tower – it came highly recommended by the locals. There’s a lovely 800m walk in the forest and down to the picnic area. There’s a Stegosaurus structure protecting the dinosaur footprints and fossil displays that have been found there. At the top of the hill is the gigantic white water tower. Walk up to the top for a spectacular vista. 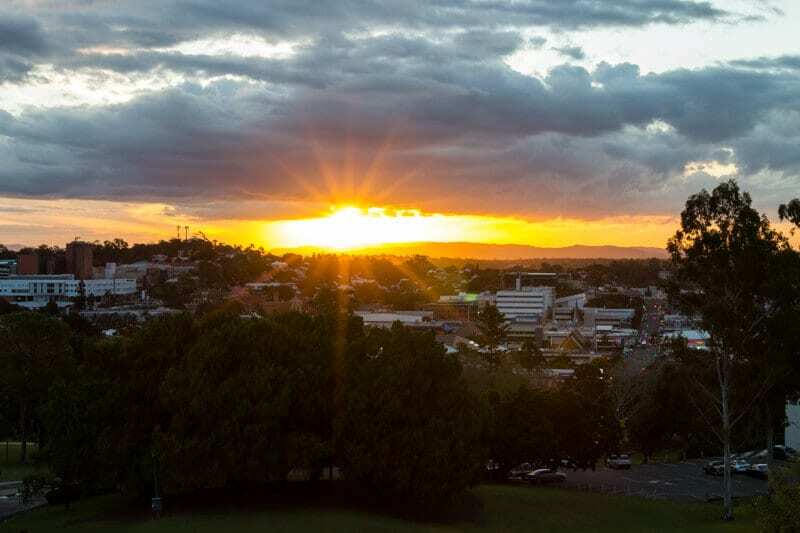 Right near the visitor centre part of Queens Park is Lions Lookout which is a spectacular place to watch the sunset over Ipswich from the band rotunda. There’s a large grassy hill here the kids can roll down while you take your snaps or just enjoy a bit of serenity. I’m sure sunrise would be equally pretty here. 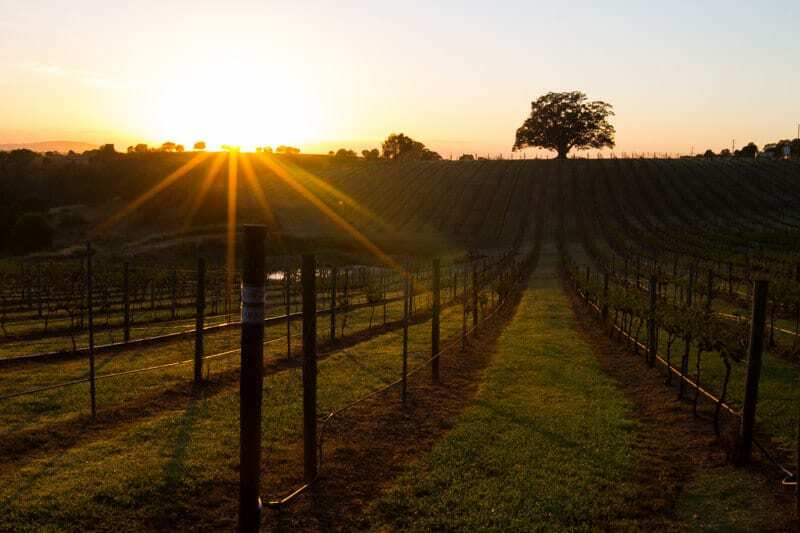 Waking up to a stunning sunrise at the “Woodlands of Marburg” property is a pleasant way to start the day. 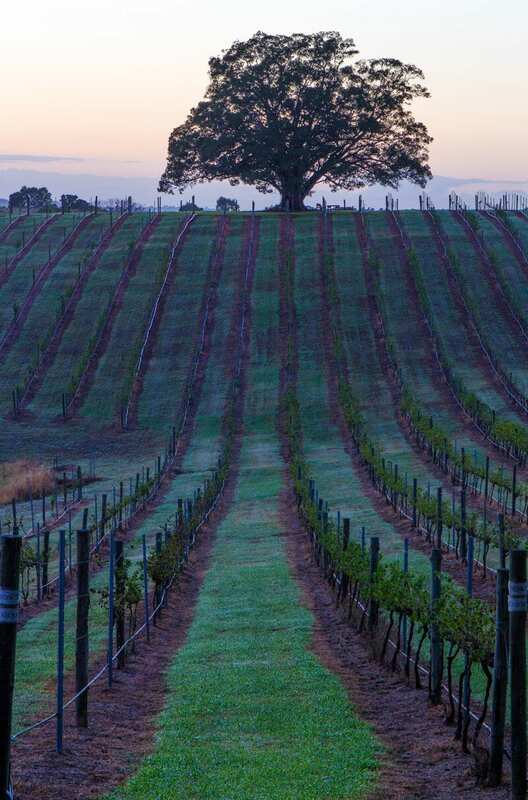 As you can see there’s a lovely big oak tree on top of the hill overlooking the vineyard. Woodlands of Marburg is a plantation style estate built in 1870 and offers a unique location for romantic getaways, day visits, dining and corporate events. This was definitely worth waking up at 5am for and the house is impressive to look at too! A couple of years ago I saw it from above with a hot air balloon ride whilst on my Amazing race around Australia! 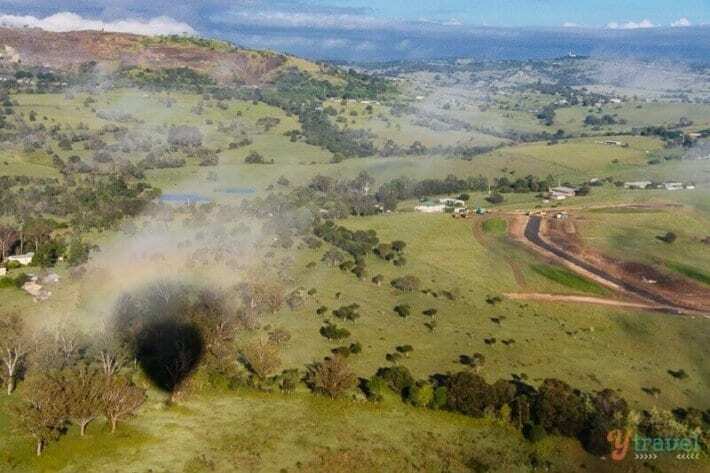 The only operator in the area is Floating Images and they fly daily over the heritage city of Ipswich, the Scenic Rim and Somerset countryside. We were also told of the slightly cool wine tasting tour you can do from a helicopter! Pterodactyl helicopters take you over the beautiful scenery to visit several local boutique wineries with lunch provided, or you can go on the Country Pub Crawl where you drop into authentic Aussie pubs to sample the beer and have some great tucker. I’m putting that one on the list for a return to Ipswich. Click on each link below to go directly to each topic or scroll manually. Forget the playgrounds, this is where Ipswich came alive for me. 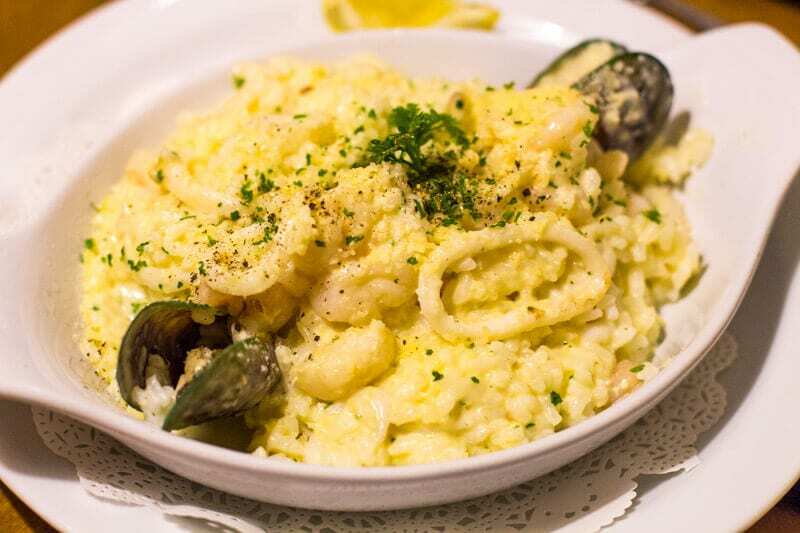 Ipswich is not the kinda place you’d imagine had great food, but Ipswich is a gastronome’s heaven! 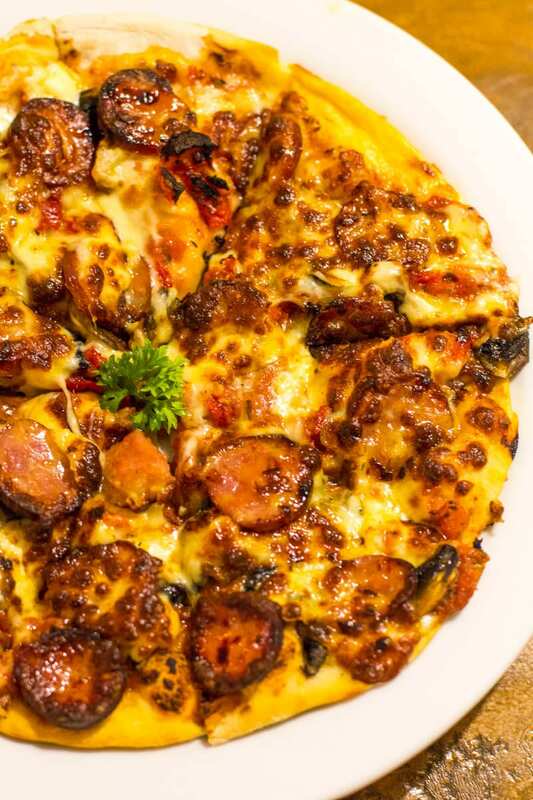 Keep scrolling for the best places to eat in Ipswich. At times, you feel as if you’re in Melbourne. I find food to be a huge indicator of how a region is progressing, and that’s why I suggest to keep an eye on Ipswich. 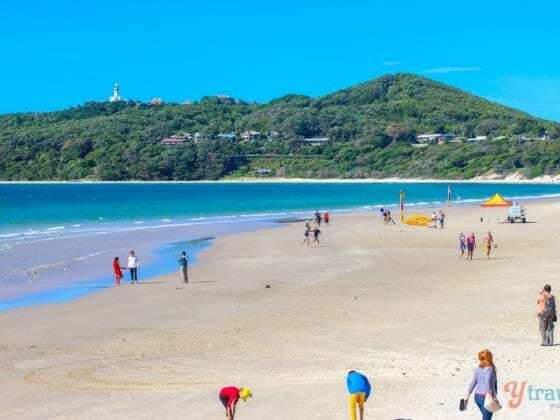 I know our current home town of Burleigh Heads has a totally different vibe and reputation to what it had two years ago and it’s largely in part to it’s growing food and locavore reputation. Ding ding ding. 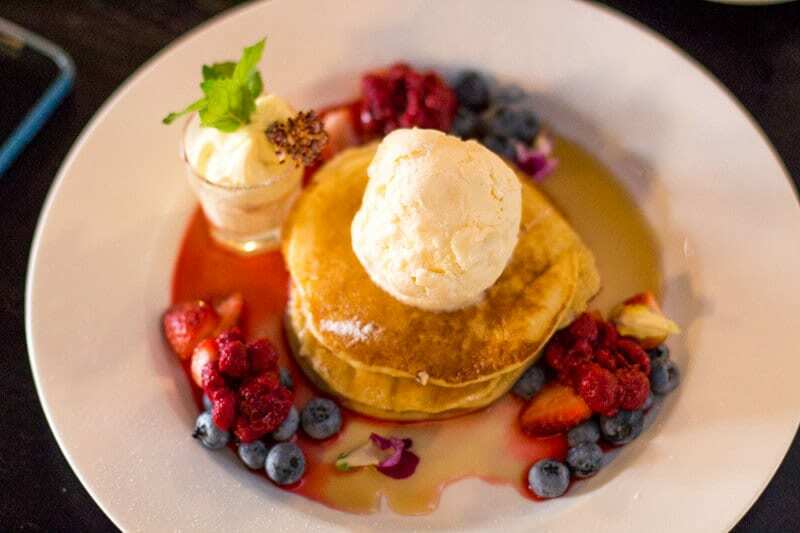 We’re calling the brekkie we had at Rafter and Rose as one of our top 5 in Australia. It was sensational. I knew as soon as we arrived and saw it’s rustic shady laneway, cobbled brick walls and flowering pot plants that we were going to love it. 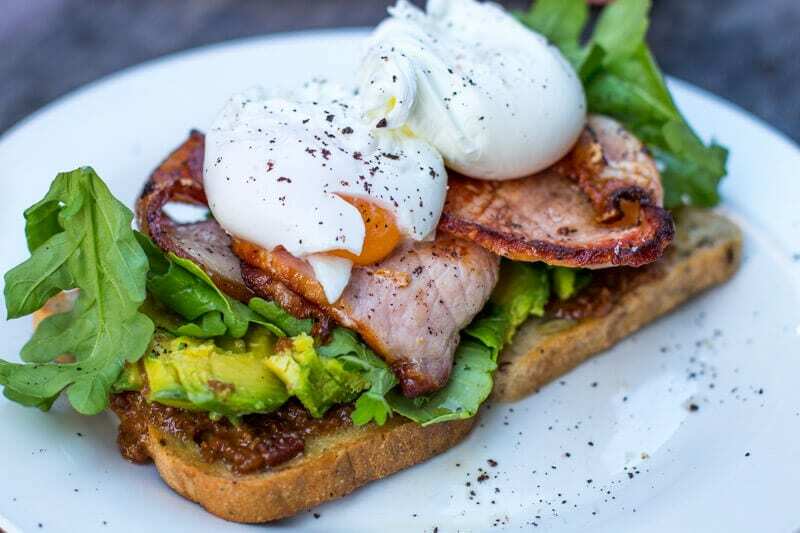 The breakfast was amazing and might look and sound like just a normal breakfast (House brekkie) of bacon, jam, avo, rocket and two eggs, but the combination of flavours with the bacon jam (bacon, maple syrup, and coffee) was out of this world. Let me tell you about the coffee, Uncle Joes. I’d not heard of this before but it’s a slower roasting coffee, which keeps the inside of the bean still quite oily. What that means is when you drink it, it’s quite smooth and not bitter and it releases an enzyme which makes it easier for you to digest the coffee. It doesn’t come with the highs and the lows of traditional coffee just a mellow middle. So for all you coffee lovers – I’m looking at you Craig – you can go back and sit and drink Uncle Joes all day and feel fine. Maybe. Do you want to run the experiment with me? 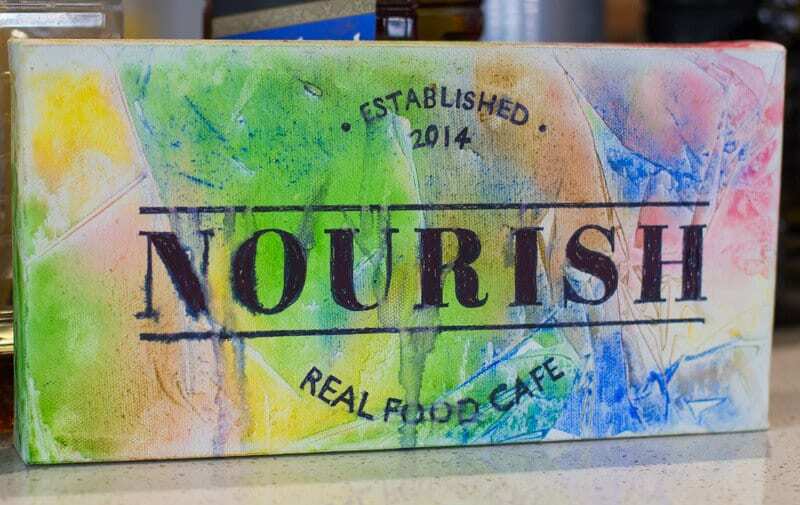 Nourish Real Food Cafe was our first eating experience in Ipswich and when my senses became alerted that this city might be a place to pay attention to. Green smoothies, acai bowls, and almond milk cappuccinos. Look out Burleigh, you have a competitor for wholesome, healthy food. I was not expecting that at all. 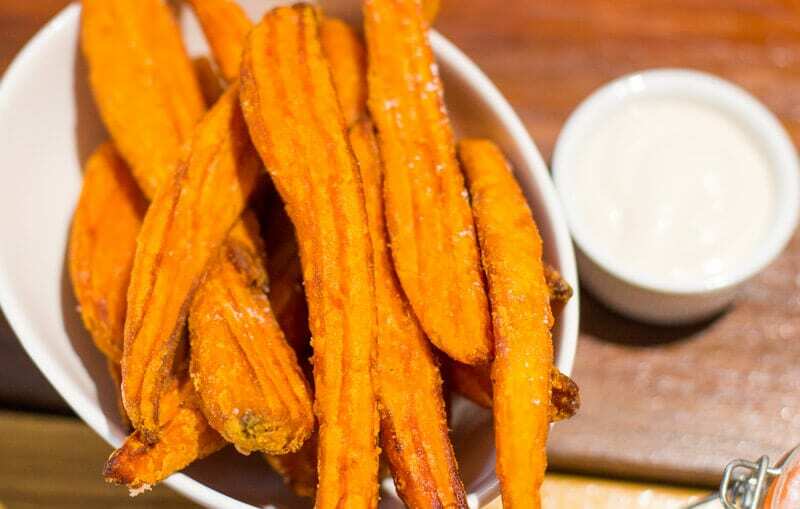 It’s very rare in Australia to find such quality gluten-free, dairy-free and paleo food choices outside of cities or popular coastal areas. It was also the kick start of the waistline expansion – coffees, smoothie and healthy foods. 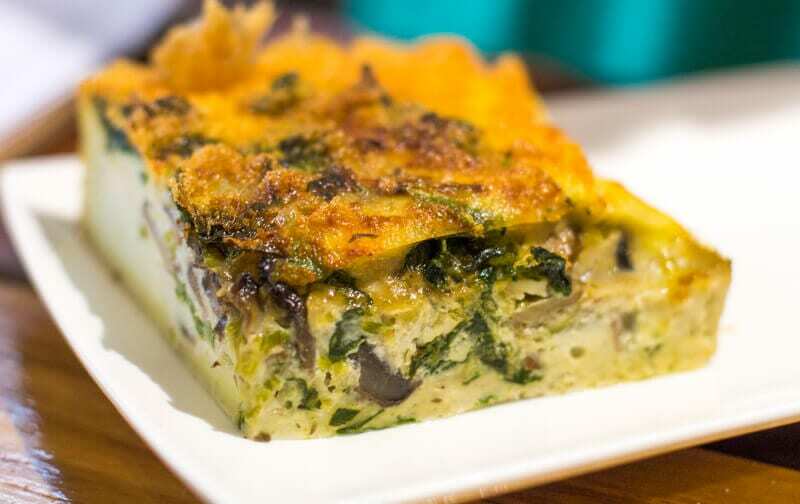 I just can’t say no, the frittata and sweet potato fries were to die for. We snapped a photo of the ingredients of the salted caramel banana smoothies as the girls begged me to make it at home. Since it was made with cashews, dates, almond milk and banana I enthusiastically agreed! 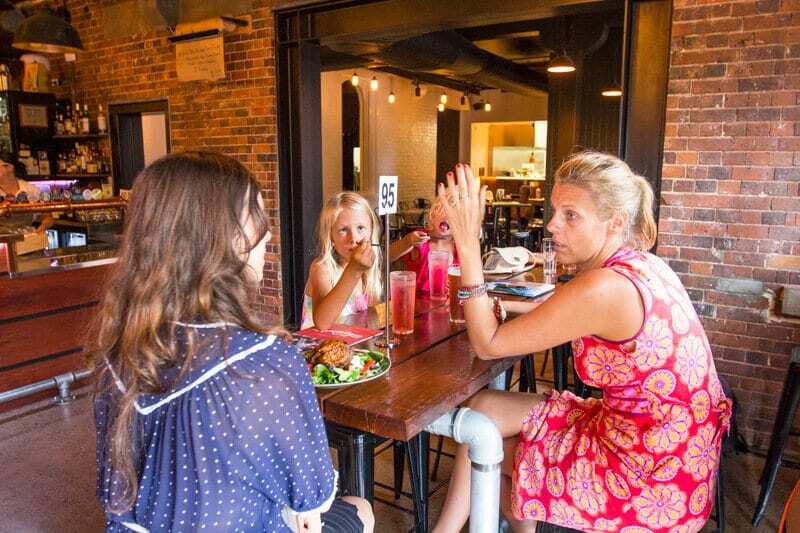 Occupying a large airy space between raw brick walls and a pressed metal ceiling vent, Fourth Child in the Top of the Town District dished us up a delicious breakfast. 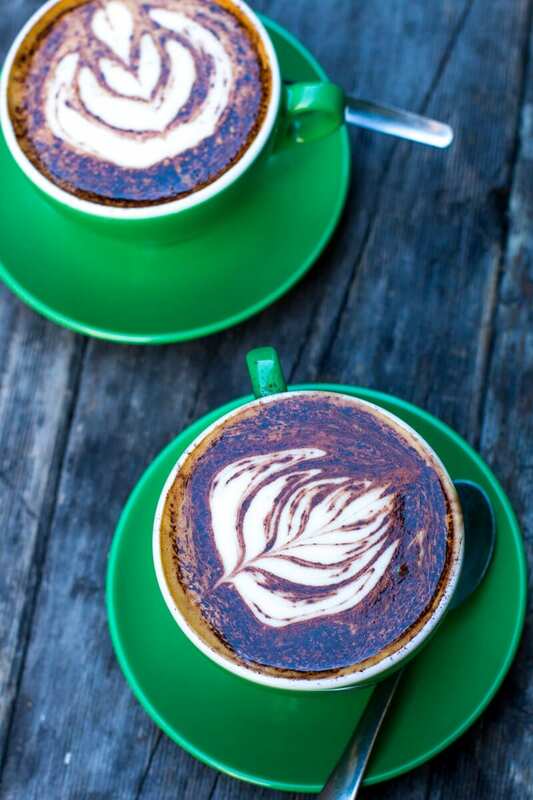 It was our last morning in Ipswich and we were happy to sit awhile, enjoy some coffee and soak up the lovely, friendly atmosphere. Craig had the lemon and ricotta pancakes. And the girls tucked into an enormous and delicious serving of kids banana pancakes topped with butterscotch sauce. 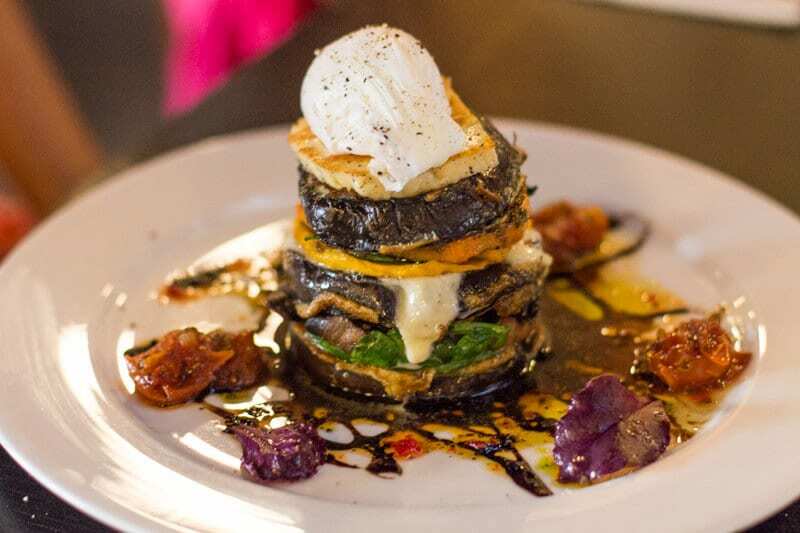 I devoured a veggie stack of Grilled eggplant, pesto, buffalo mozzarella, spicy tomato, sweet potato, pumpkin, spinach, mushroom and halloumi, topped with a poached egg. YUM!!!! So now I want to go back to Germany. Heisenberg Haus was an amazing restaurant and totally buzzing, which we found surprising for a Monday night. The Ipswich restaurants make it a no brainer to plan another vacation here. Seriously-the food is to die for!! The menus come in Grimm’s Fairy Tale books. Kalyra read Savannah a couple of stories while we waited for our food and then dived into more after Savannah fell asleep on my lap. 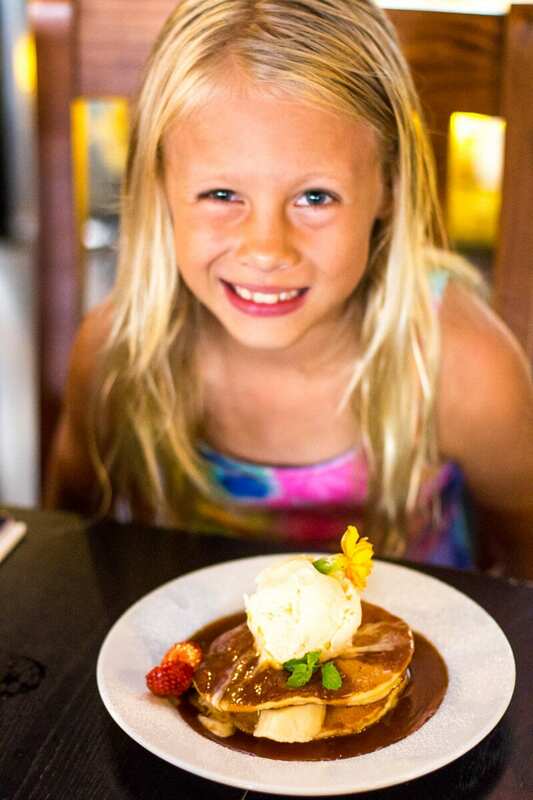 The menu features traditional recipes from Austria and Germany and were huge in size – Kalrya’s kids schnitzel was the biggest meal I’ve ever seen her eat. 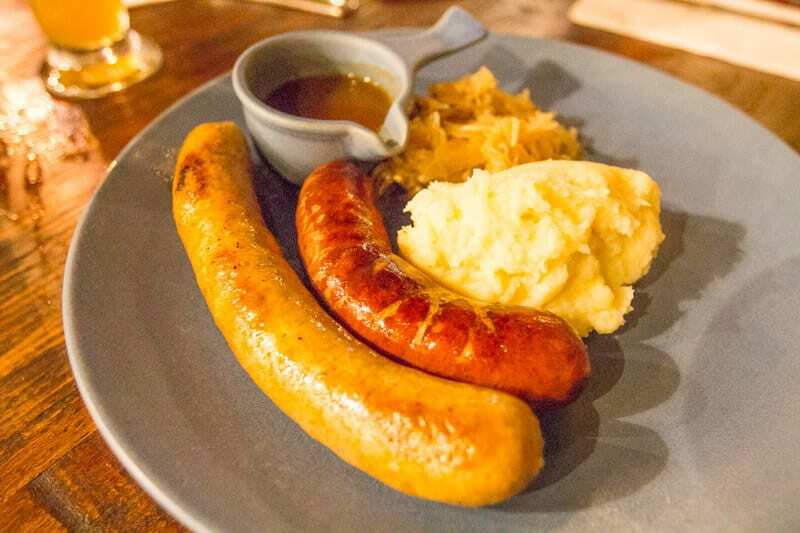 I couldn’t say no to a plate of wurst – kransky and brat with mash and sauerkraut. The sauerkraut was to die for. 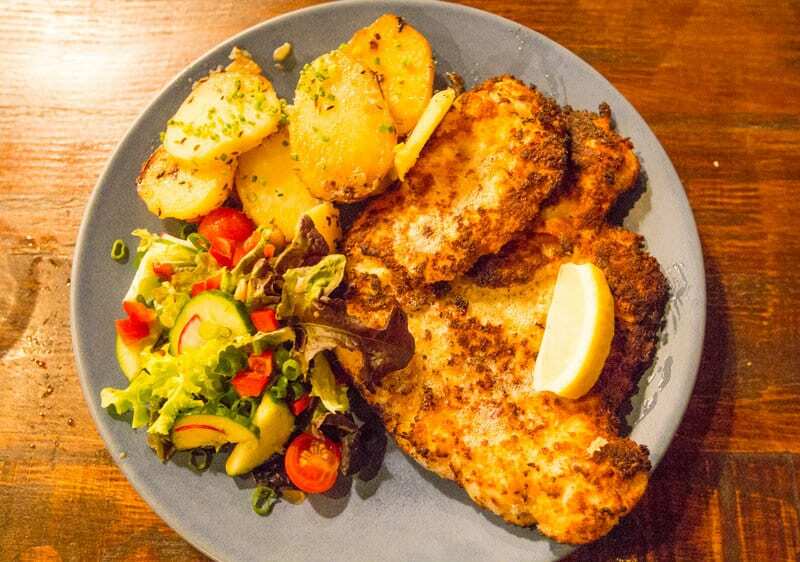 And Craig also had a ginormous chicken schnitzel with pan-fried potatoes. There’s plenty of good German beer on tap as well from some of the best breweries in Munich – did we expect otherwise. 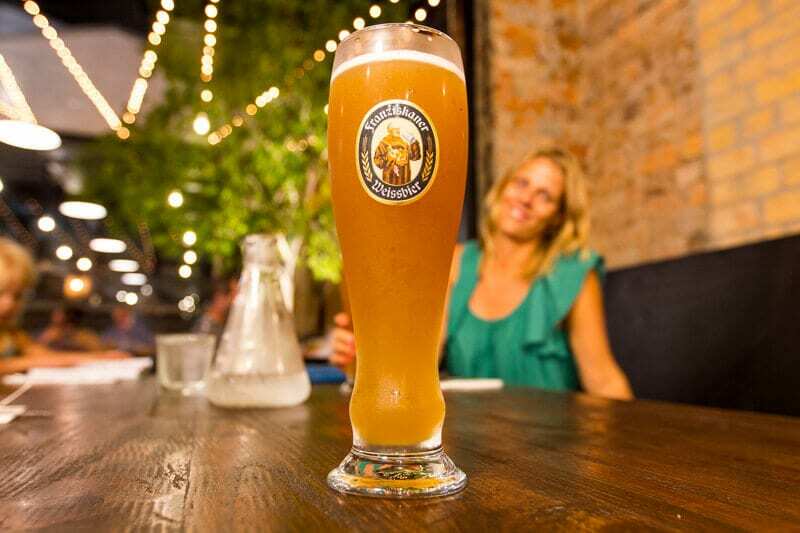 I don’t like domestic Australian beer, and my favourite beer is weissbier so I ordered a pint of the Franziskamer and guzzled it down almost immediately. I’m not supposed to drink beer because of the gluten but I could not resist getting another one. And I felt fine after it! The super friendly waitress guided us through the menu at Casa Mia, a newly opened Italian restaurant, just outside of town. We had a lovely family meal here with a bottle of Italian vino to accompany the meal and some gelato to finish it. 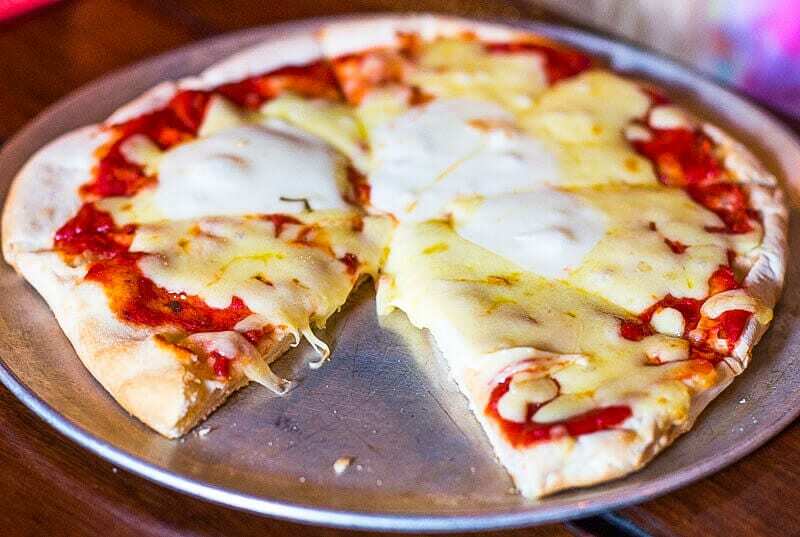 You can’t do Italian without it! 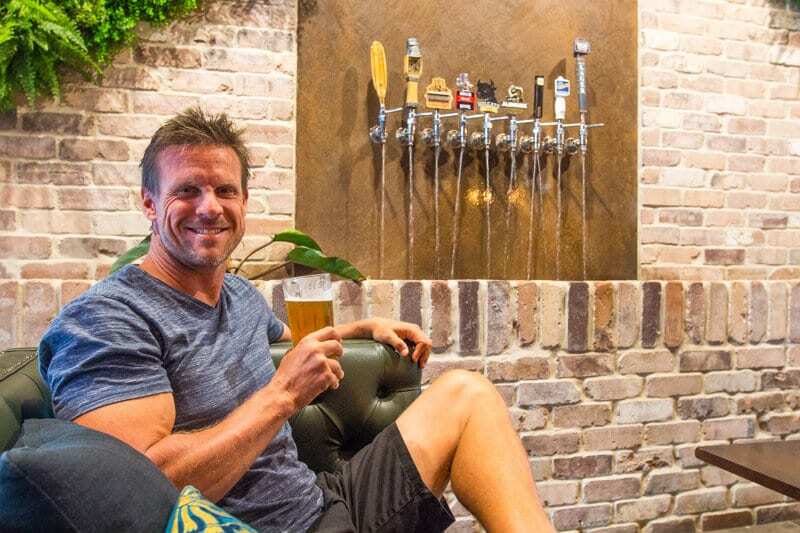 The 4 Hearts Brewing Pumpyard Bar and Brewery is located in the character filled basement of 100-year-old heritage listed building and is the first brewery in Ipswich since 1903. You’ll get an authentic brewery feel here with the shiny vats sitting next to you in the bar and it maintains its old industrial flair with naked light bulbs hanging down, exposed ducts, red brick walls, and crafted timber tables. We also heard their coffee beer was a crowd favourite. These weren’t on the recently brewed list when we were there, unfortunately – any excuse to return! We tried and loved their Summer Wheat. The brewing mission here is to brew beers with full flavour, no chemicals, nothing artificial and no preservatives. 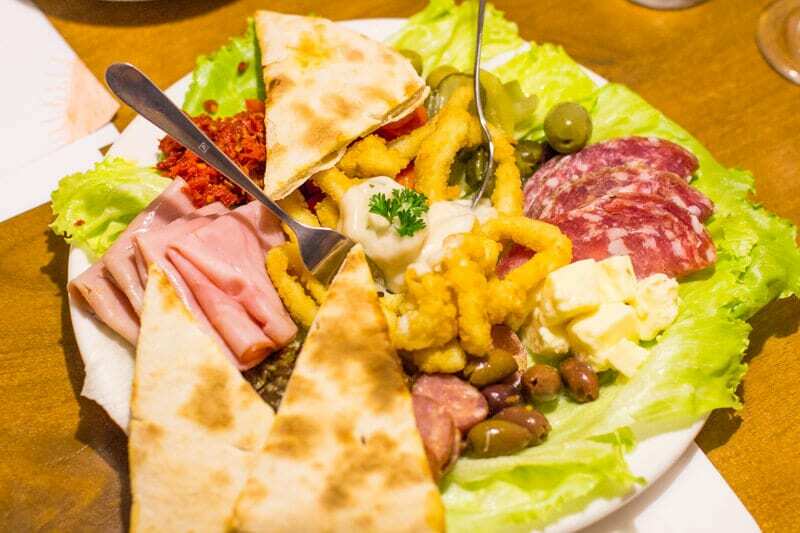 This is not just a place to sample incredible beer, but also amazing food. 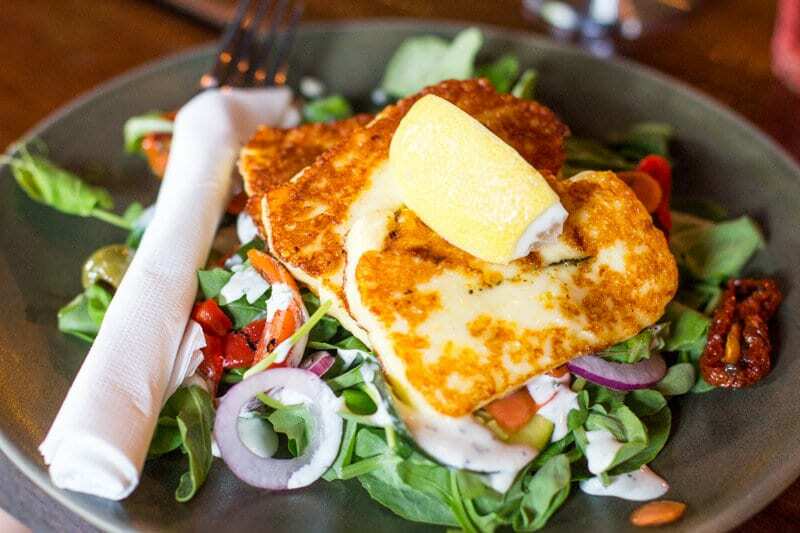 The halloumi salad (Haloumi, Olives, Roast Capsicum, Pickles, Snow Pea Tendrils, Rocket & Citrus Mint Dressing) was one of the best salads I’ve ever had. and Kalyra gave her cheese pizza a double thumbs up. Most of the produce for their meals is sourced from the local region. We love local sourcing! This was a last minute recommendation to fill in a spare hour we had before sunset and dinner. Boy are we glad we found it! 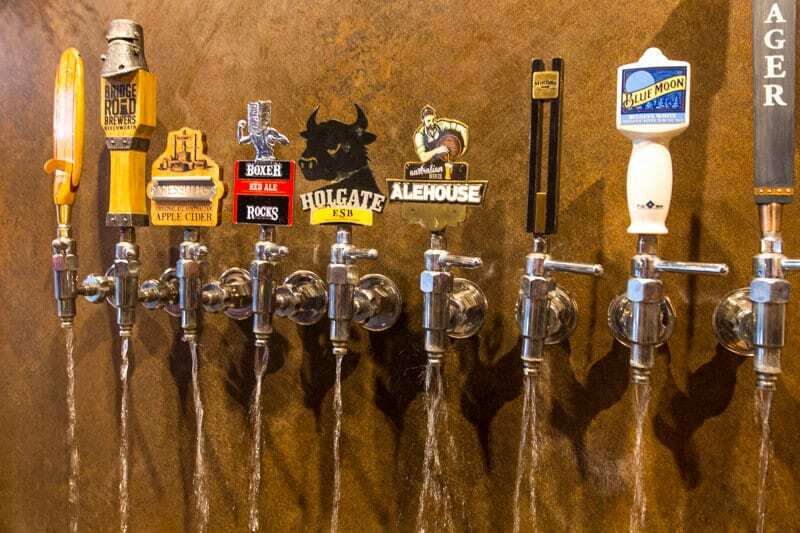 Tap’d at the Prince Alfred Hotel in Booval just outside of town has 72 craft beers on tap!! Yep, that’s a Southern Hemisphere record. As craft beer lovers, this was such an exciting find and it took us ten minutes to go through the list and make a choice. And how cool is their water feature! We pulled up a comfy seat beside the beer and cider tap fountain, shrouded in greenery, and enjoyed one of our favourite beers from the USA, a Blue Moon, while the girls played in the games room. We could have easily stayed there all night, but sunset called us. And get this – our Blue Moon was on special for $5 a pint!! 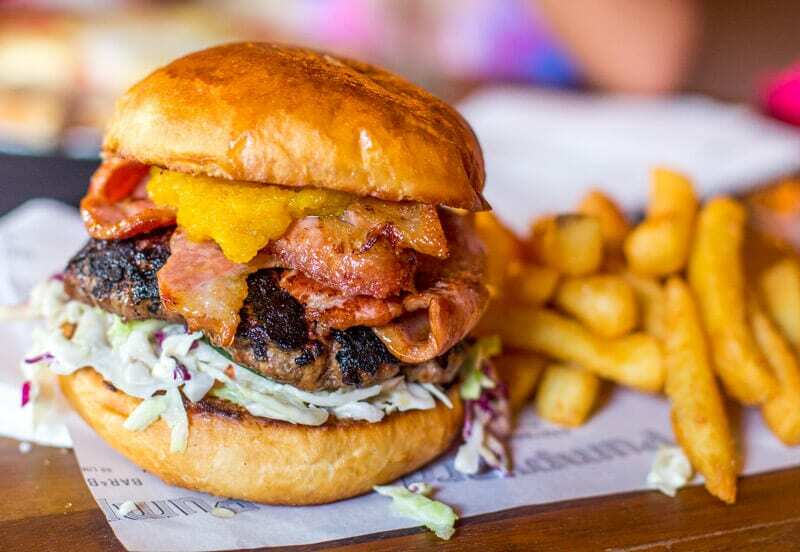 You won’t find that anywhere else in Australia. What’s great about Tap’d as it forms one section of the newly renovated Prince Alfred Hotel and if hungry, you have your choice of bar snacks, buffet meals, or fine dining from the Char’d restaurant. And besides the beer selection, Craig was excited about the numerous large TV screens for watching sports! This venue is an all-in-one. Again I’ll reiterate that we were beyond impressed with Ipswich restaurants! We’re typically not museum people and it takes a really good one to keep us interested. As far as the Workshops Rail Museum goes, we were impressed! If you’re a train buff, you are going to love this museum. 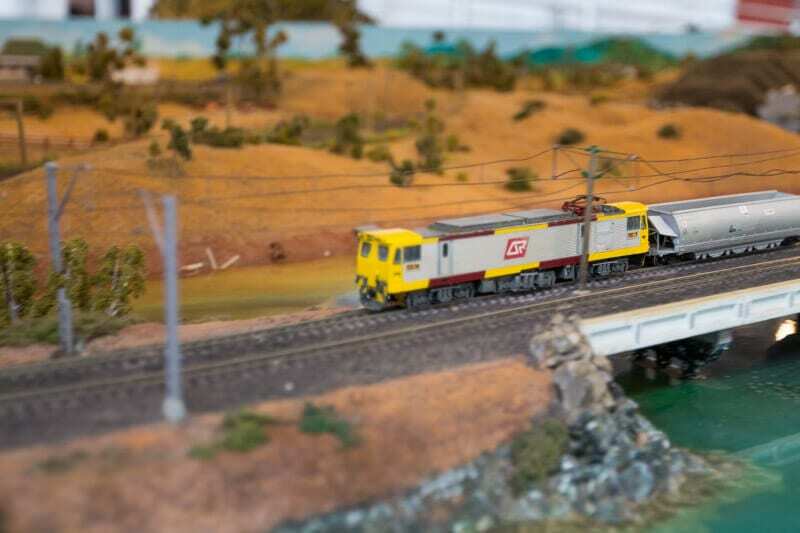 It’s the biggest in Queensland and the oldest continually operating railway workshops in Australia. This was actually our first experience in Ipswich and it was then that I knew I was in for a few days of pleasant surprises. It takes more than a diesel train to excite me, but this museum was interesting and engaging. It was highly interactive for the kids and well-designed with a child’s heart in mind. 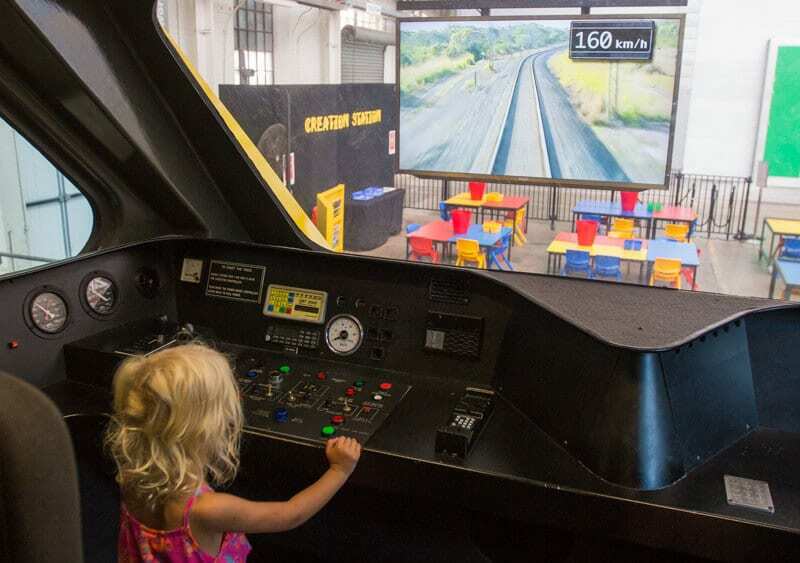 The girls drove both a diesel locomotive and modern passenger train in a simulator (trust me, you do not want me in control of a train – which one is the brake again?). They dressed up as station guards and train drivers, and were pushed along little train tracks in a cart (thanks Mum and Dad for providing the horse power). 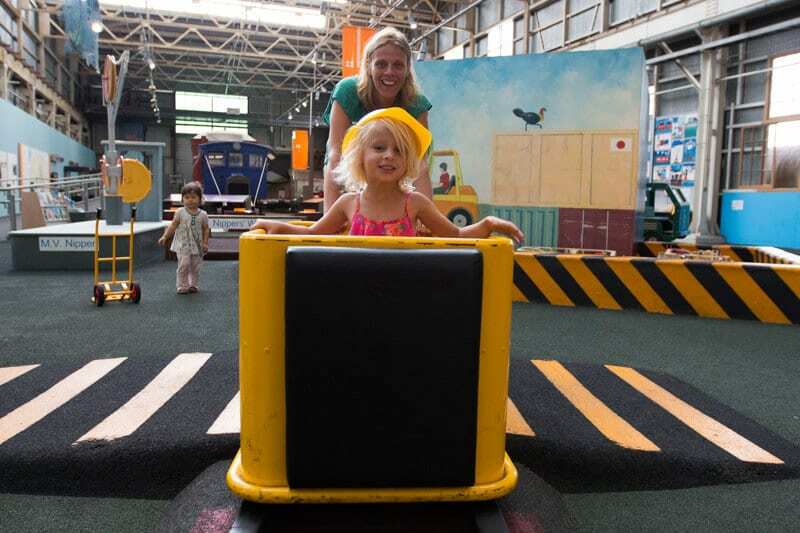 In the middle of the old boiler shop, which houses the collections, is Queensland’s largest model railway. 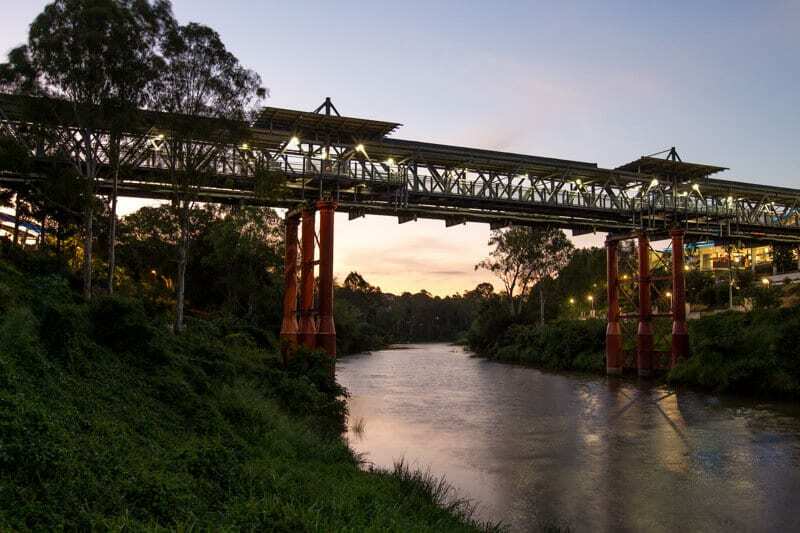 It features detailed real-life scenes within Queensland from Outback to industrial towns to the rainforest showing how the trains help transport goods and services in between these areas and reminiscing about our experience on the Kuranda Scenic Railway through the rainforest in Cairns. You can also enjoy Steam Shop tours here but bring your closed in shoes! We weren’t prepared and could not attend with our thongs! Wow, just writing this post reiterates that Ipswich packs a lot in. Once again Queensland keeps surprising us with yet another destination that offers unexpected fun. I can’t tell you how much we love living in this state. 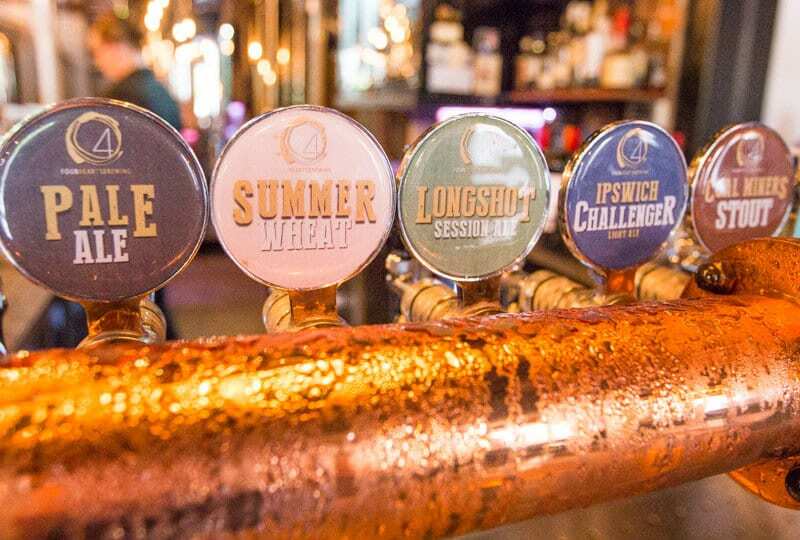 If you’re looking for a quiet getaway – one that doesn’t have the glitz and the glamour and the rushing from one tourist icon to the next thrill seeking theme park – but one that gives you the chance to amble slowly, savour your meals, taste flavourful beer, and connect more deeply to those you love, Ipswich is a place we highly recommend. 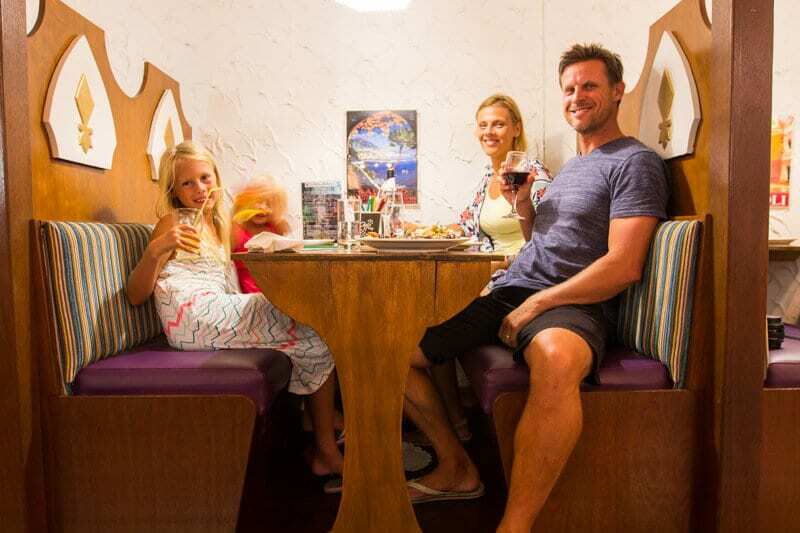 It’s a thumbs up from Mum, Dad and the kids too! They’re already asking when we can go back. 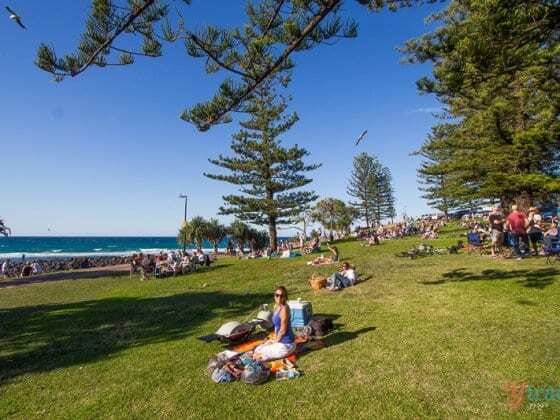 Thankfully, we can do any easy day trip from the Gold Coast – winning! Subscribe to our YouTube channel as we have a video on Ipswich come soon! We stayed at the Quest Apartments on Warwick Road in a 2-bed apartment which were modern and within a 5-minute drive of the city centre. There’s a pool, free car parking and high-speed internet access is available. RentalCars.com is the world’s biggest car rental booking service that compares all the major brands like Hertz, Avis, Alamo, and Europcar. Book your care rental in Ipswich here. Need more tips for Queensland? Do you have any tips on things to do in Ipswich? Leave a suggestion or even a question in the comments below! I’m just dying to go to Australia, thank you so much for the inspiration on some things to do once I’m there! We live in Ipswich and may be guilty of saying west of Brisbane in the past haha but Ipswich has so much going for it these days for locals. The playgrounds are great as we have 2 young kids. The food is right up there too. We just tried Heisenberg Haus ourselves for the first time on the weekend and it was great. Nice to see acknowledgement of Ipswich’s growth and improvement! I really like your spirit to live life. I see your family they are really cute specially two little angels. It’s been great time to be here for a while. Thanks, Keep doing good work….Keep traveling !!! Great work Caz ! from your article, I know much more information about the Ipswich and I am fairly willing to visit it one day to experience it. Thanks!